With roots in the military (created for WWI bombing pilots, hence the name) and the masculine shape, to back up its historically stylish and practical features — chiefly comfort, warmth, and ease of movement — the bomber jacket is a traditional all-year round essential in menswear. Widely considered the jacket of the season, the bomber comes in a wide variety of versatile textures and styling options, easily suiting all tastes and seasonal conditions, from lightweight waxed cotton for spring/summer to exceptionally warm, fully lined leather or suede classics, that can handle the harshest winters thrown their way. However despite all its advances and easy styling options, getting the fit of a bomber jacket right can be a tricky thing to get right, especially with its unconventional shape. I found mine from Pepe Jeans Loncon and I really love it. The fit of any piece of outerwear, bomber included, is really important, as it’s the piece that can make or break an outfit. Needing enough space to layer over a range of outfits, while being close enough keep you warm and, well, not look like a sack – a bomber’s fit is just as important as any other piece of clothing. 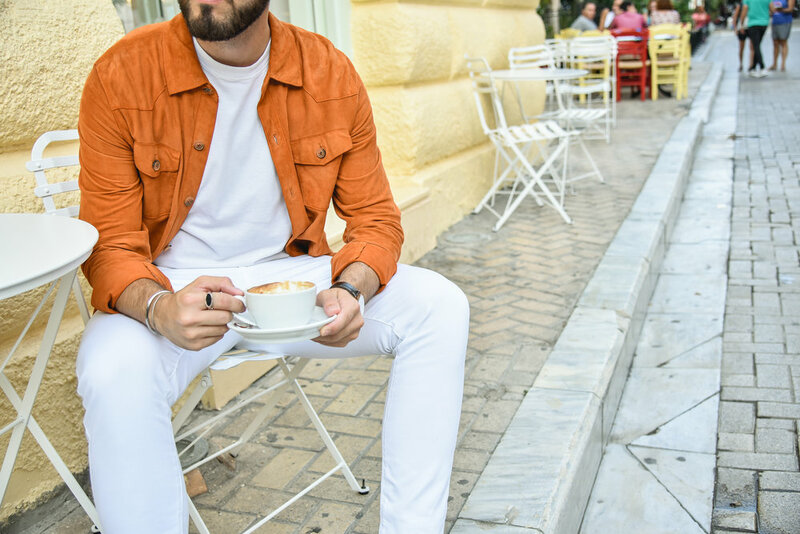 Whether you’re going for a classic bomber jacket shape or a longline design, it’s important that you’re working with a jacket that looks its best and complements your body type. It’s universally agreed that the most crucial aspect to a perfectly fitted jacket lies first and foremost in the shoulders. If they don’t naturally fit then the jacket is a loss, as even if you’re going for an oversized style, baggy shoulders is never a good look. In this case, the fit is the same as any other jacket and it’s important that it carefully frames your shoulders, giving you a smooth, clean look. To double check that your jacket is perfectly fitted around your shoulders make sure you’re following these basic rules. 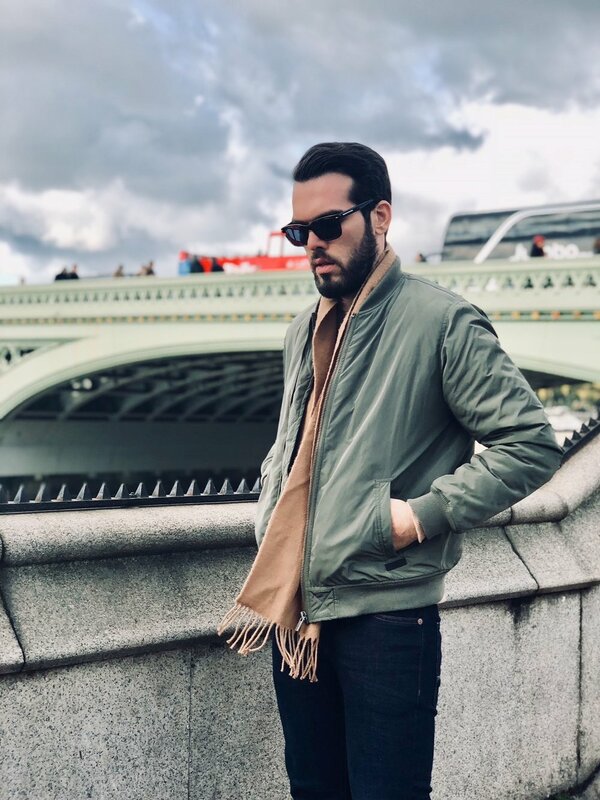 Bomber jackets tend to be a little less streamlined than conventional jackets, with the traditional, durable style focusing on a more statement, padded look. However this ‘bulkier’ look is generally created by the materials used, with the leather outing and inner lining causing a heavier finish, and on the whole, you want to go for a fairly fitted look so you don’t run the risk of looking swamped. Because of the cropped design of the jacket, you want to create a flattering V-shape when you have it zipped up, with the padded edge fitting closely around your torso. The easiest way to tell if your jacket fits properly in the waist is to try it on and see how much excess material hangs on each side and underneath your arms. Anything sticking out more than an inch on either side should be considered as being too bulky so you should opt for a smaller size. Chest wise, it should fit comfortably slim, with little to no added weight. You want something that will be form fitting whether zipped up or left open. 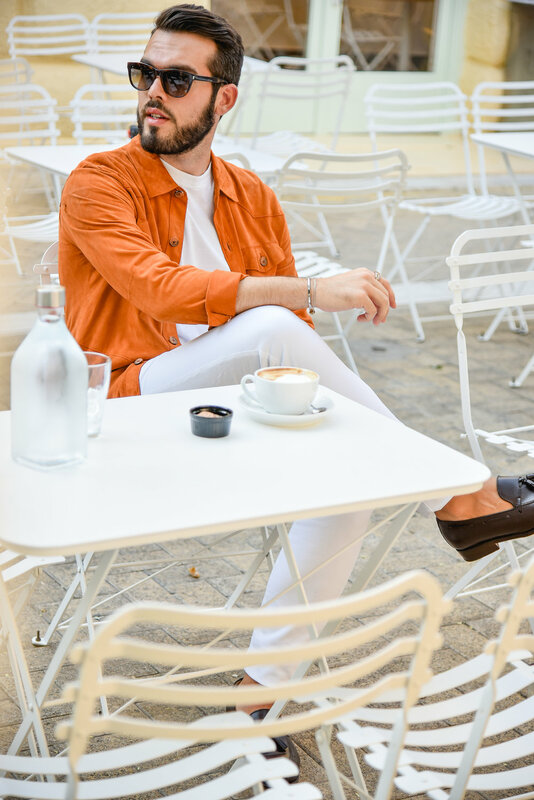 Length wise, unless you’re going for a modern long line design your bomber jacket should land on the top of your trousers, or just above, in order to elongate the appearance of both your torso and legs in a subtle way. One of the distinctive features of a flight jacket is the knitted collar that frames the neck, contrasting to the chunkier look of the jacket itself. Originally added in to protect the wearer from the high altitude winds, it’s now a distinctive part of the look, so it’s important that it fits correctly. The collar generally extends up a little, giving a clean, streamlined look that encompasses the neck. Don’t go for a design that goes too high up the neck as you want to gain a flattering, complementary look, but not get a roll neck finish. If you’re going for a more striking, padded design made from a thick material and an inner lining, your sleeves are generally going to be a little bulkier to match with the rest of the jacket. However, if you’re going for a more slim fit nylon design it’s important to make sure your sleeves are fitted and have the right amount of stretch. Bomber jacket sleeves have a unique design, with each one ending in a knitted cuff that fits snugly around your wrist. Each sleeve should end on or just above your wrist bone, with conventional designs showing a clean contrast in size between the main part of the sleeves and the cuff. 2. Size it up. Pick a tie that hits the top of your belt buckle and measures between 2¼ and 4 inches (5.5cm - 10cm) wide. 3. Remember textures. Wear wool ties with tweed or heavyweight jackets, and silk ties with business suits. For a deeper color quality on silk ties, make sure they’re woven, rather than screened. 4. Match colors. When it comes to colors, there are literally thousands of colors available in mens' bow ties, striped ties and paisley ties, more than you can imagine. First of all, you have to decide which color of tie will go with your overall attire and the occasion. Select a tie that has the colors of your suit and shirt as well as at least one other color to provide an accent. For formal occasions, choose a solid colored tie that’s darker than your shirt. Younger men, or men living in warmer climates, tend to prefer colorful ties (and shirts). 5. Look in the mirror. Frame your face. If you have dark hair and a dark complexion, go with a bright tie; if you’re fair, choose a darker tie. If your hair and skin tone contrast, wear a tie that contrasts with your skin tone. 7. Stay classy. Thanks to the latest fashion trends, even men are getting numerous styles in accessories which are also true for the neckties. There are traditional ties with a broader formation and this is best for the men who are broad shouldered and muscular. When in doubt, stay subtle; while a tie can be the focal point of an outfit, it’s an accessory and shouldn’t pull the focus away from you. 8. Take care with weekend wear. The addition of a tie to casual weekend wear is something to be done with discretion. You don't want to dress it up too much as casual shirts aren't supposed to look as if they're about to go to the office or the annual director's dinner. The way around this is to wear a simple, classic tie over casual shirts with a simple but bold pattern. To go really casual, wear a plain t-shirt (or one with a subtle design) with a loose tie. Try to avoid wearing pattern on pattern. Exceptions are sometimes if one pattern is very subtle, and the other pattern is bold, drawing attention away from the subtle pattern. The last thing I want to hear again in this world is the stereotype that men do not care about shoes, or that all women do. Men have to choose thoughtfully their shoes. It's the only thing women will notice on the first date and your future boss will notice it too. Here are some simple general rules on how to choose the right shoe with the right outfit. 1. Try to pick a shoe that matches, or is darker than your pants. 2. Although it is a safe bet, socks do not need to match your shoes. Instead, think of your socks as you would a tie - an item that can bring bring the whole outfit together. 3. If wearing a belt, try to match your shoes to it, unless of course, your belt is some multi-colored striped thing. 4. With your jeans, you can wear almost any color or style of shoe but avoid very shiny shoes that were obviously intended for more dressier outfits. Boots, lug soles, sneakers, loafers and sandals all work great with jeans, so you may find it helpful to let the style of your shirt guide you. 5. For casual pants there are a variety of loafers, oxford and other men's shoes that work well with them. Let the ornamentation and style of the shoe guide you towards the look you're trying to achieve. 6. With dress pants, shoot for the same type of shoe that you might wear with a suit. Shinier materials usually indicate a dressier shoe, as do less bulky heels and soles. Choose a shoe that is the same color or darker than your pants, and if wearing a belt, match your shoes to it. Color matching is a big deal too. Below you will find my 4 simple tips on how to color match your outfit with your shoes. Follow them, dress up and impress! i) Black shoes work well with navy, grey or black pants. ii) Brown shoes are best suited to tan, brown, beige, greens, other darker earth tones. iii) Burgundy shoes work well with khaki, lighter browns, blue and grey. iv) Tan shoes look great with lighter earth tones, blue, beige, lighter tan or white.